The Strategic UK CO2 Storage Appraisal project completed and published in early 2016 by the ETI/DECC confirmed that the UK Continental Shelf (UKCS) is endowed with a rich and diverse national offshore CO2 storage resource that could be mobilised into service readiness without extensive appraisal programmes. This is due to a wealth of prior knowledge arising from decades of petroleum exploration and development activity from commercial and national organisations. Whilst the UKCS hosts many high quality potential storage sites, the ETI project concluded that the UK’s requirements for CO2 storage through to 2070 could be accommodated by the mobilisation and development of just 8 sites. This portfolio of 8 sites spans a range of geography, geological storage types, development timetables and development risk. Further details are provided here. This work has highlighted several key areas where further focussed, practical research and development effort can significantly contribute to cost and risk reduction for CO2 sequestration projects from the mid to late 2020’s. This short article seeks to define these areas further to inform, support and shape thinking around research and funding options. The scope of the costs considered here is that contribution to a full chain power or industrial CCS project is made from the offshore transportation, injection facilities and monitoring activities. Since cost is not always related to the scope and ambition of a storage project, it is probably best to focus on cost per tonne of CO2 injected in a viable development plan. This is expressed in the ETI project outputs as a “Levelised Unit Cost” of CO2 transportation and storage representing the full cost of ownership through the life of the storage project for the offshore developer. The Levelised Unit Cost is the sum of the discounted (net present value) future cost profile divided by the sum of the discounted CO2 injection profile expressed in £/tonne. The figure above illustrates the average Levelised Unit Cost across the full 8 site portfolio which was estimated to be a little below £15/tonne. Some areas of the cost base are already exceptionally well explored and defined and have relatively low potential for further cost reduction. 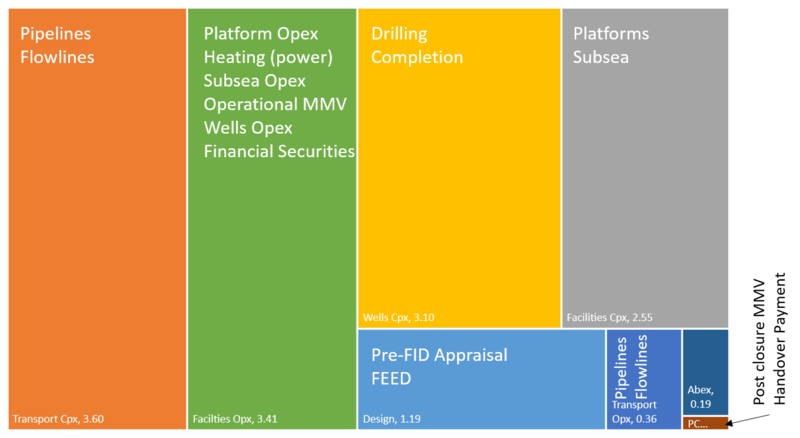 These include those activities which are “business as usual” for the oil and gas industry associated with pipeline, platform, subsea and well construction capex and opex. Cost reduction demand in these areas is a normal oil and gas business focus; expending specific research effort into these activity areas for CCS purposes is likely to be low yield. The ETI report identified a need for phase control for injection of CO2 into very low pressure reservoirs whilst preserving full ability to control the injection process and manage the phase from the pipeline through the wellbore and into the reservoir. Whilst several options were briefly considered, the project concluded with a long term heating solution at the wellhead prior to injection which represented a significant additional cost in both energy use and emissions profile. A detailed review of other practical options is required to avoid this heating requirement and thereby reduce costs. Additional options could include improved flow and phase modelling technology coupled with the use of downhole pressure control devices or gas blending prior to injection to manage the phase envelope through compositional engineering. Ongoing work looking at phase control in injection wells around start up and shut down must be extended from normally pressured or modestly depleted formations where the main focus is on operability through to very heavily depleted fields. The ETI report puts much emphasis on “Storage efficiency” which can be compared to the “recovery factor” in petroleum extraction. As hinted at in a recent webinar and elsewhere, this concept seems to have generated interest with stakeholders. Here, Storage Efficiency is an output from the reservoir simulation work rather than any input to a calculation. It is defined as the volume proportion of pore space within the target storage reservoir volume that can be filled with CO2 given the development options considered at a point 1,000 years after the end of injection operations. Using the ETI models as a base, R&D should focus upon innovating alternative viable technologies and development plans which might result in higher CO2 storage efficiencies. Placement of mobility modifiers such as polymers or relative permeability modifiers. Refining model parameters for CO2 relative permeability may be of use. Successful approaches might need more wells, but will hopefully harvest improved storage capacities and an improved levelised unit cost per tonne for the whole development in such sites of lower storage efficiency. The recovery of geomechanical strength of highly depleted formations upon re-pressurisation towards original conditions is poorly understood and a matter of uncertainty to ultimate storage capacity estimation. Specifically, if the rock strength does not recover then it risks an integrity failure long before the reservoir is fully repressurised and this will limit the ultimate capacity of the formation, significantly reduce storage efficiency and risk an increase in the levelised unit cost for transport and storage. a. Detailed modelling and analysis of data-rich, highly monitored gas storage locations which go through regular pressure cycles during their operation to understand how mechanical strength and integrity vary across the pressure cycle. This should be extended to include the propensity for both fault reactivation as well as primary fracture initiation and propagation. Ideally, this should involve the use of passive microseismic technology to identify any events resulting from the cycling. A further potential target for this analysis might be an analysis of mechanical strength data collected around hydraulic fractured shale gas sites which are in close association with both normally pressured and highly depleted conventional reservoirs in the US. b. Detailed experimental testing of mechanical rock strength of a series of representative formation types under a range of confining pressures to examine the impact of pressure cycling on geomechanical integrity and potential fault reactivation. Although the primary cost focus of the ETI report is the levelised unit cost of transport and storage (which is independent of the source of CO2), the report also frames costs in terms of Levelised Cost of Electricity (LCoE). This reflects the UK policy landscape at the time of this work. However, in the wake of the cancellation of the DECC competition, the CCS narrative has broadened beyond solely de-carbonising electricity generation and thereby CCS support policy must be developed beyond the EMR (Electricity Market Reform) and its CfD market mechanisms. There is an urgent need to identify policy routes and potential new market and commercial models to encourage the uptake of CCS for heat and also whole process industry systems. Of particular importance are further developments in storage site financing models including such areas as public-private partnerships and other mechanisms which seek to socialise some critical elements of risk sharing. Typically, serious progress requires commercial discussions around real projects to crystallise the advances required. As such any R&D effort must be rooted in industrial practicality and involve full “simulation of the commercial process”. The results of this will inform future policy development for both the UK and overseas jurisdictions. A core component of the value delivered by the ETI report is the significant contribution of an existing detailed catalogue of potential storage assets. Together, the existing CO2Stored database hosted by BGS and the Crown Estate, the results of this Strategic UK CO2 Storage Appraisal project and the knowledge transfer materials from the DECC competitions’ FEED studies provide an important resource for the further de-risking and cost reduction for potential CO2 storage operators. The varied portfolio of sites studied in the ETI project means that there are generic learnings and potential workflows that can be drawn from this which will have relevance for, and support activities in other geographies outside the UKCS such as elsewhere in Europe, the US and in Asia Pacific. Further work is required to investigate where this UK knowhow can be immediately leveraged elsewhere in countries that have ambitions for offshore CO2 storage. Specifically building upon current knowledge of programmes already in place and how UK experience might contribute to making these programmes even more efficient and successful would be a goal. One key mechanism for achieving this would be for UK institutions to partner with overseas institutions to contribute to ongoing programmes. Further develop the case for the socially acceptable cost of CO2 abatement such that policy can ensure that the polluter pays the cost of abatement. This should include encouraging policy makers in the UK and elsewhere to rationalise conflicting policy objectives of reducing carbon emissions whilst maximising economic recovery of national hydrocarbon resources. Dr. Mike Edwards is the Strategy & Business Development Manager for the UKCCSRC. He plays a key role in industrial engagement for the UKCCSRC and in promotion to external stakeholders and potential funders, advancing and supporting the Centre’s development. The UKCCSRC is supported by the Engineering and Physical Sciences Research Council as part of the Research Councils UK Energy Programme and by the Department of Energy and Climate Change. This work, however, represents the personal opinion of the authors and should in no way be taken as representing the opinion of the UKCCSRC, of its sponsors or of the authors’ employer organisations in any way whatsoever.